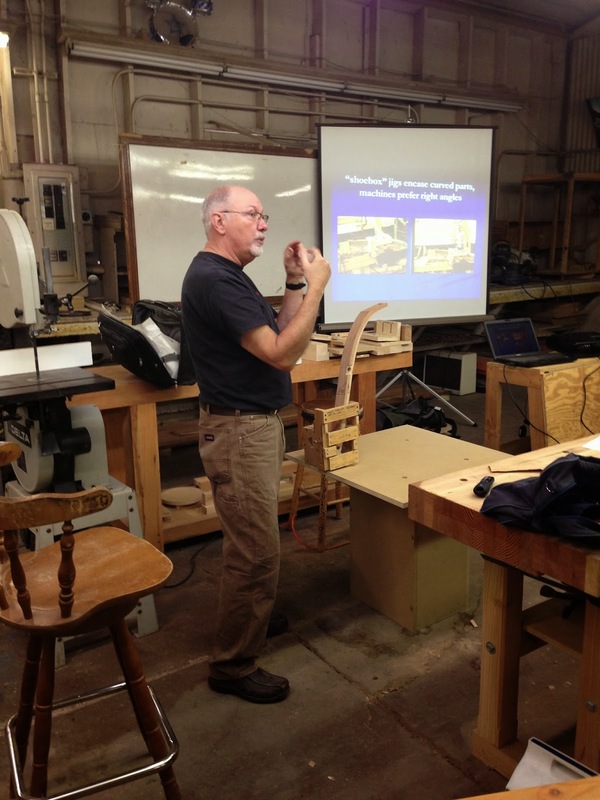 This seminar included bandsaw setup and demos along with discussion of how he designs and makes chairs. 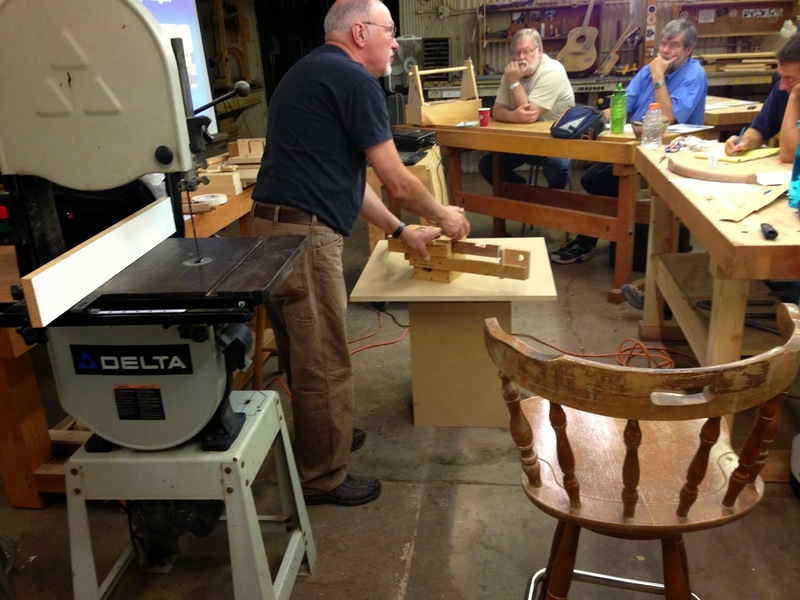 Nothing hands-on; all lecture including a slide show of all his chairs and the jigs that make them (some chairs have over 50 jigs). This article is a compilation of bits and pieces I wrote down that you may find interesting. 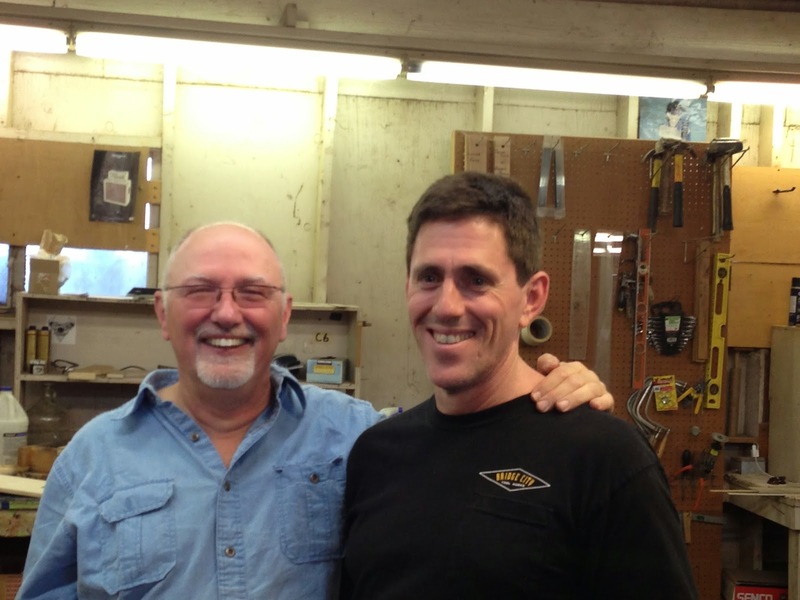 I realized that I'd be embarrassed to have him over to my shop since I have a relatively large bandsaw with a 5hp motor and a 1 ¼" Resaw King blade. Michael's most-used bandsaw in his production shop is a simple 14" bandsaw with a ⅓ hp motor and a mud-flap under the table acting as a zero-clearance insert. In fact, he has four of them so they can be setup for a particular jig and left there until completed. All the saws typically have ½" 3 tpi blades from BC Saw in Canada. He's a big fan of having your blade cut parallel to the miter slot since his work is very jig-oriented. Fortunately, I set my saw that way so I could have shown him that to get over the 5hp embarrassment :). Rather than adjust your fence to get it parallel to the cut, take the extra time to loosen the table bolts and adjust the miter slot to be parallel; they adjust your fence, once. An interesting observation he's made about bandsaw blades: with each resharpening, the set is reduced so they have a narrower kerf. They also track straighter so he keeps twice-resharpened blades for packet-cutting drawer dovetails. An interesting side note: when working with exotics, they oxidize, which makes their surface a bit of a glue release causing glue-up problems. Commonly, people wipe the edge with acetone, but it's faster and works better to remove the oxidation with a quick swipe of P150 sandpaper before applying glue. While I don't build furniture to be upholstered, Michael wrote an interesting article for Fine Woodworking where he covered using different densities of foam to create a more comfortable pad as well as discussing design elements for properly designing the pad. Who knew you could engineer foam padding? Before moving on to how he builds chairs, he talked about steam bending. Only works with air-dried wood since kiln drying sets the lignin making bending unpredictable; this confirms what we hear on the Internet routinely, but I actually assumed the master of bending would have a trick for kiln-dried stock. His chair arms and legs are steam bent while back slats are hot-pipe bent. His steam chamber is kept at 200ºF+ for 45-60 minutes per inch (no less; no more). Bending always uses a compression strap, but he prefers to bend a stick one way, move the strap, then bend it the opposite way. Once done, you can now remove the strap and bend it by hand into final position. This is something I need to try. Always let the piece cool and set in a jig to hold it in place. No need to overbend; it will hold the final position. When hot-pipe bending, keep the pipe between 200-212ºF. You're looking to generate local steam. It seems luthier sites want a 300-350ºF pipe for side-bending. Since steam is the key, perhaps local steam generated with a 212ºF pipe vs high-energy steam vapor from a 300-350ºF pipe softens the lignin faster. This is also an experiment I'd like to try. While building a chair, Michael uses a level platform and box used for clamping parts to and taking measurements; platform and box both have centerlines drawn so distances from centerlines can be taken anywhere. Everything works off the centerline. At times you want to hold an item out in space because "that's where I want it". To measure where a model leg is in space, he uses inclinometers. The inclinometers give a degrees off plumb measurement. With this number, the leg can be clamped to a ladder-like fixture with the same inclination. By measuring and clamping items spatially to the platform, you are creating a full-size model and are able to take measurements directly off it. Also allows for jig building for drilling or morticing on compound angles or for clamping finished assemblies together. He described an interesting technique for matching curves in a chair. Picture an arm-to-back joint. The end-grain of the arm needs to be contour-cut or scribed to match the curve of the back. In most commercial chairs, this joint is simply a compound angle with the attachment point on the back left flat. If the back is curved, he clamps the back and arm in their final spatial orientation with a gap between the end-grain of the arm and the back. 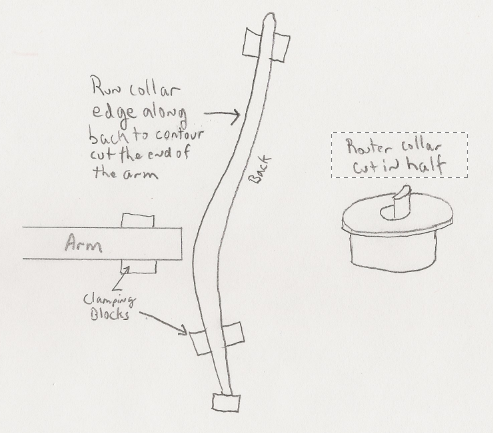 He modifies a ³⁄₈"router collar by cutting it in half vertically (just the collar part :) Put the collar on the router with a ¼" spiral bit. Now run the router with the half-collar rubbing against the back so the exposed bit can cut the arm's end grain. It will cut a matching curve in the arm. Technically the radius of the cut curve differs from the back's, but those radii are so large that the ±¼" error is negligible. Oddly interesting side story (of which there were many! ): The book "British Campaign Furniture" was all ready-to-assemble cabinets. Scandinavians took this to create a non-agricultural economy long ago. The first Ikea catalog has a lot of similarities. While describing the design of his Ash chair, he mentioned that the black inlay was... sewer pipe :) He uses the pipe plastic for the inlay since it resists bleach used to bleach the Ash whiter. When using a compression strap for steam bending on Walnut and Oak, the metal will stain the wood due to the tannins if left on too long. I wonder if a strip of packing tape between the strap and wood would help with this. Since he makes his own hinges from brass stock, he has a small 9" Ryobi bandsaw setup with an ⅛" 14 tpi blade. Before cutting non-ferrous materials, he'll push a wax block into the blade to load it up then wax over the pencil line on the stock to continue the lubrication during the cut. Otherwise, the metal can stick to the blade. This same bandsaw is used to cut mother of pearl for inlays. I'd like to try cutting mother of pearl on a bandsaw as the oscillating blade of a scroll saw tends to lift it out of your grip. Since much of the lecture was watching him build a mock-up chair on the platform, my notes are a bit random from tangent stories. 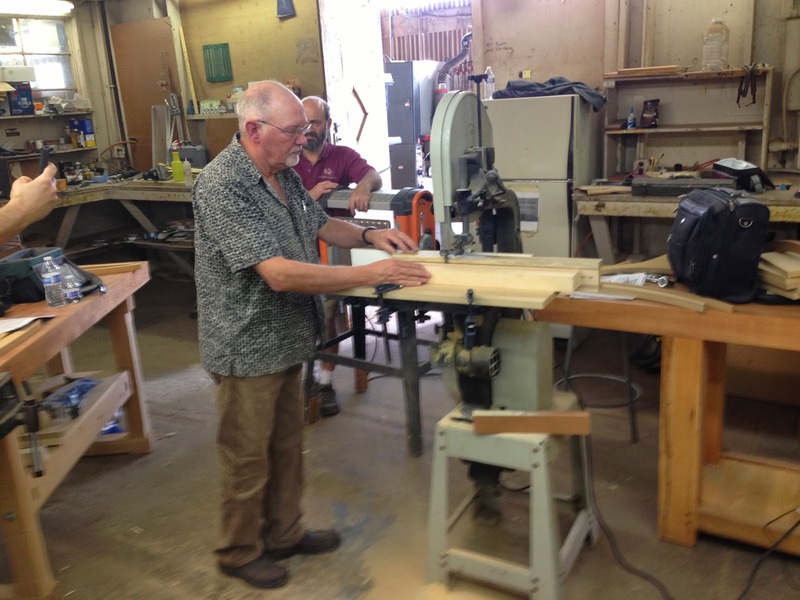 Michael is returning to the Southwest Center for Craftsmanship next month to teach a chair building class, which includes building a chair rather than just discussing it. Looking forward to that class. Michael sells a CD that contain a copy of all his articles, some with extra material edited out by the magazine publishers. 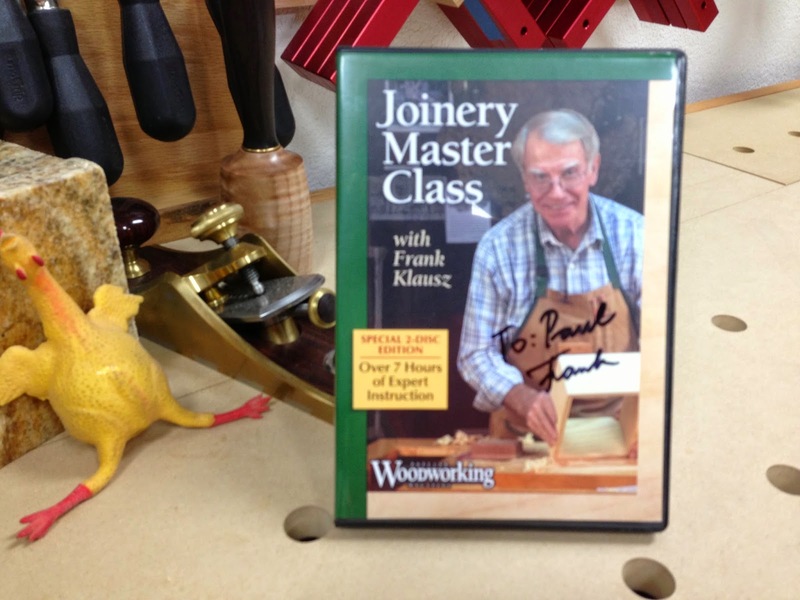 There are also the class handouts for all the classes he teaches on the disc including documents on chair design, chair construction, design process, woodforming techniques, and jigs and fixtures, of which he has several for the bandsaw. Well worth adding to your library. Sorry for the disappearance; it was nice getting emails from readers wondering if I got run over by a Zamboni or something. My day job exploded with overtime when a third-party contracting company was found to be a <insert polite word for fraud>. As I'd peel layers of the project's proverbial onion back, I'd find more massive bits of ugliness requiring rework or plain restart. When I go to the shop to work on Angle Madness, I like a big chunk of time to record and figure out the complicated stuff; tiny bits of shop time don't work well for that. Plus, I was kinda tired. 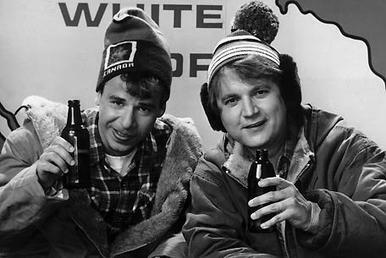 So, I apologize for the disappearance, but I also didn't want to bug you with a "hey I'm busy" posting. 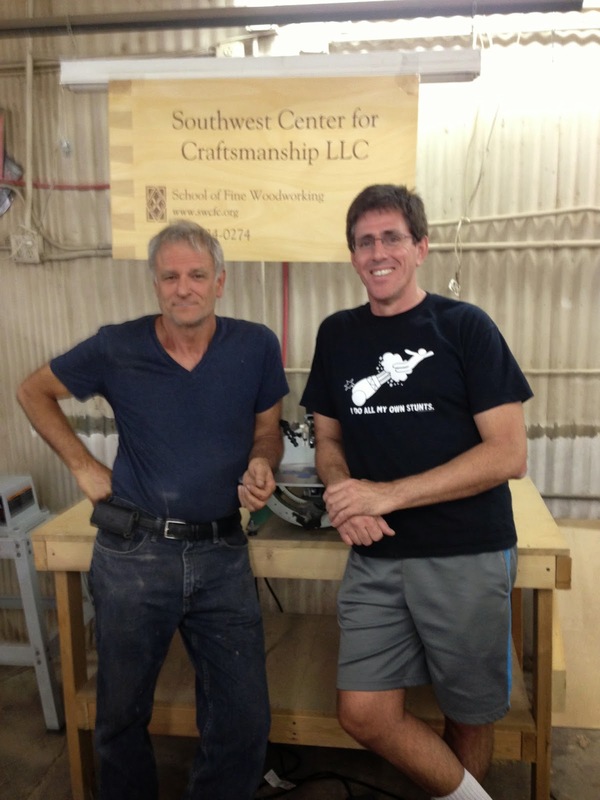 Recently, though, I got a chance to take a number of classes at Southwest Center for Craftsmanship including building a Queen Anne chest of drawers reproduction with Frank Klausz, a marquetry and decorative veneering class with Paul Schürch, and furniture design also with Paul Schürch. I'll be posting articles about each of these classes. Since the marquetry class was the same one Paul taught here before. I sent Paul a private video where I described an advanced project I wanted to do in the back of the room with periodic guidance from him. He was all for it as he really wants to see the art of marquetry grow. I've started recording some of the special aspects of this project to eventually turn them into a video. 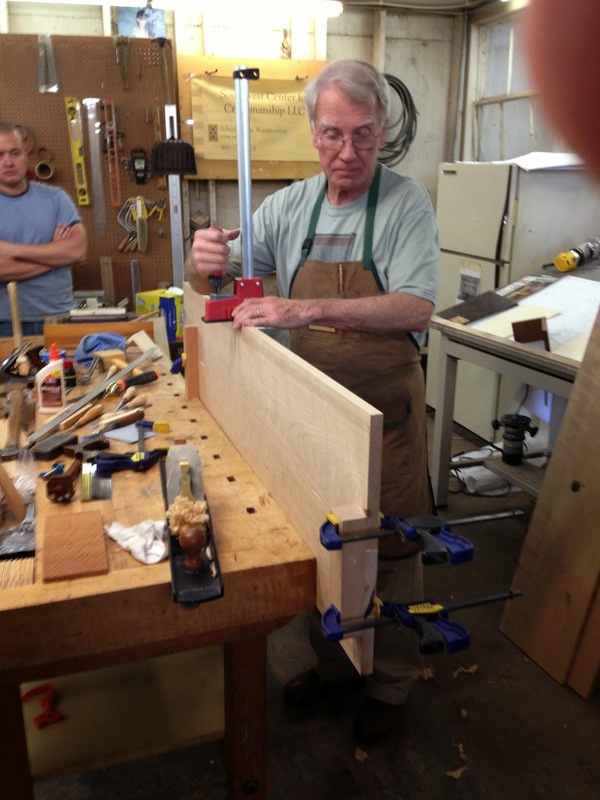 Further, mid-May, Michael Fortune will be conducting a chair and table building class here. I recently took a class with him back in November that was more a lecture/seminar class; after this blog posting, you'll get a dump of some of the interesting things I picked up in that class. I have been working on Angle Madness with limited time; I have numerous finishing experiments in place, which should be fully recorded soon. Okay enough about this... next up, what I learned from Michael Fortune back in November's seminar lecture! Oh, yeah, I hung around with Frank as much as I could without, you know, being weird. You learn stuff from close proximity. A week after the class was over, I received this nice gift in the mail... thanks, Frank!